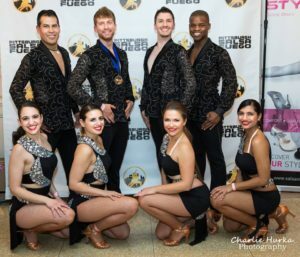 About – Los Sabrosos Dance Co.
Los Sabrosos Dance Co. is a dance and fitness organization whose mission is to help individuals find freedom, passion, self-expression, and self-confidence through dancing & fitness. LS Dance Co. offers confidence-building group and private dance classes for diverse interests, from Salsa & Bachata to Ballroom classes (waltz, jive, rumba, etc), Yoga, Hip-Hop, Bellydance, Zumba & Vixen Fitness classes, and more! We also offer specialized workshops, all guaranteed to make you more comfortable and at-ease when dancing on your own or with a partner. Visit our Calendar to see what we are teaching this month! LS Dance Co. offers classes and workshops at quality rates, with discounted prices for student youth, low-income individuals, veterans, and seniors. All people of all ages are encouraged to attend lessons. No partner necessary. Check out the Lessons page to see what lessons we are offering this month. LS Dance Co. instructors and performance teams perform at dance events, weddings, birthday parties, club fundraisers and other special events. We also teach dance lessons for group events and choreography for wedding couples. Please contact us if you would like a performance or lesson for your private event. Los Sabrosos Dance Co. ardently focuses on partnerships and collaborations. LS Dance Co. is a member of the Pittsburgh Salsa Roundtable, a non-profit organization that promotes salsa and latin dancing in Pittsburgh! LS Dance Co. hosts and collaborates on events throughout the city of Pittsburgh, including the surrounding areas. Keep an eye on our calendar, contact us, or sign up for our monthly newsletter to be notified of the next dance event. LS Dance Co. started as a part-time project by Nicolette Pawlowski, to support her work on her Ph.D. Her uncle, Martin, recommended the name Los Sabrosos, as it meant “full of flavor”, which is how we wanted to teach people to dance. The small project grew into a multi-dance operation, with its own storefront space. We now offer kids and adult classes in many “flavors” of dance, adding ballroom, bellydance, hip-hop, West African dance, and many other delicious dance flavors to our menu of classes. Why dance with Los Sabrosos Dance Co.? Perhaps you are wondering why you can’t simply watch a couple of YouTube videos and learn on your own. Perhaps you have tried some dance classes and weren’t that excited after the lesson. Perhaps you are wondering what our courses can even add to your life. LS Dance Co. stands out in several ways. Our instructors have years of training under their belts. We are not just good at dancing. We are really good at teaching. Many of our instructors have backgrounds in teaching and education. Our director has a Ph.D. in Educational Policy Studies and has studied teaching and education for many years, in addition to teaching in multiple settings for over two decades. We do not skimp on instruction time. Our instructors receive ongoing instruction in dance and in teaching. Our goal is to teach you to dance, in the most enjoyable way as possible. Our instructors use course syllabi that come from years of experience and critique from other professionals. We do not sell the “secrets” of dancing. 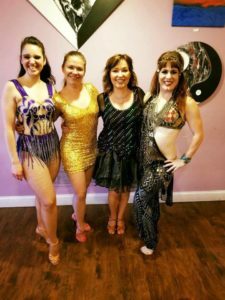 We offer instruction and guidance in making you more comfortable and happy with your body, your dance technique, and your dance presence. We extend our instruction beyond the classroom. Why learn to dance if you can’t use it on the dance floor? You will see Los Sabrosos Dance Co. instructors dancing in the salsa scene with their students. You will see our ballroom instructor at ballroom socials and our bellydance instructor at haflas. 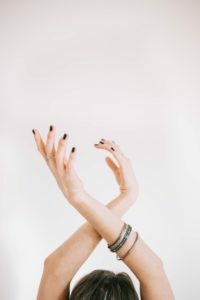 We will offer you advice on how to approach people to dance and encourage you to dance with as many people as possible in order to improve your dancing even more. Regardless whether you are a current, former or potential student, we will dance and invite you to dance with us. Dancing is not just our business, it is our passion. 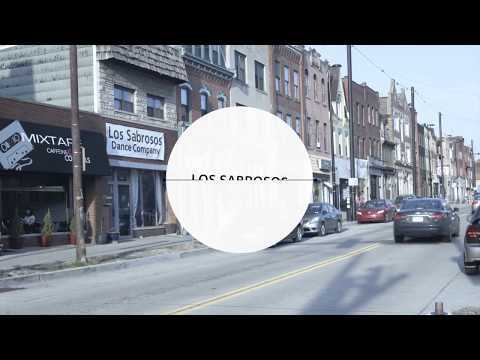 call us at (412) 465-0290, or email us at pgh.lossabrosos@gmail.com.